Welcome to the online home of the friendliest mountaineering club in the south of England! 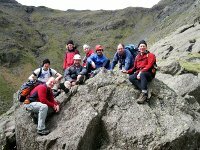 The Oxford Mountaineering Club has a membership of over 100 keen mountaineers, climbers and hill walkers mostly based in the Oxford area. We welcome enthusiastic people of all abilities and walks of life! We typically run two meets a month, with destinations all around the country and occasionally abroad. We also have our own hut, Cefn Garw, in Snowdonia, where members can stay without booking. Whether your interest lies in completing long rounds on the hills, classic mountaineering routes, or roadside cragging, you're sure to meet some like minded people amongst our membership - so why not pop along to the Angel and Greyhound the next time we're there and get to know us.